Rustington have been told to ‘roll their sleeves up’ as they pursue the treble this season. The Blues dropped points in SCFL Division 2 for the first time since September when they were held to a 2-2 home draw with ten-man Westfield on Saturday. 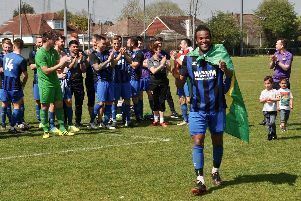 Chris Darwin had fired Rustington ahead but second-half strikes from Steffan Davis and Joao Pedro Bannos looked to have put Westfield on the way to becoming the team to end Kerry Hardwell’s unbeaten run as manager. However, Josh Irish struck from the spot as Blues salvaged a draw. That point could prove invaluable come the end of the season and it was enough to see Rustington climb a place back to the summit above Roffey. But manager Hardwell acknowledges his troops cannot allow their standards to drop as they did against Westfield. “I’ve told the lads that complacency is slightly creeping in. If we are to be as successful as we can be this season then it’s time to roll our sleeves up and start grafting for each once again,” Hardwell said. Darwin looked to have put Blues on their way to a 15th straight victory inside three minutes. Gary Peters’ defence-splitting pass sent Darwin racing away and he kept his cool to slot the hosts ahead. Westfield were reduced to ten men after 20 minutes when Robert Higgins received a straight red card. Rustington were sloppy and allowed the visitors to level on the hour. Davis was left unmarked to head home from close range. Remarkably, Westfield then completed the turnaround five minutes from time. Oli Chick’s throw found goalkeeper Billy Nash, although he took too long on the ball and Pedro Bannos nipped in and slotted home. But there was to be one final twist as Rustington preserved their unbeaten record this season. Substitute Steve Kirkham was hauled down in the area and leading scorer Irish fired the spot-kick home to save Blues’ blushes. But Hardwell knows Rustington will have to show a marked improvement if they are to maintain a title challenge on three fronts this season. Blues, now back on the top of the division, travel to sixth-placed Jarvis Brook on Saturday. RUSTINGTON: Nash; Gilchrist, John, MacIver, Miles, Hudson, Jenkins, Peters, Ryder, Irish, Darwin. Subs: Chick, Kirkham, Anderton.